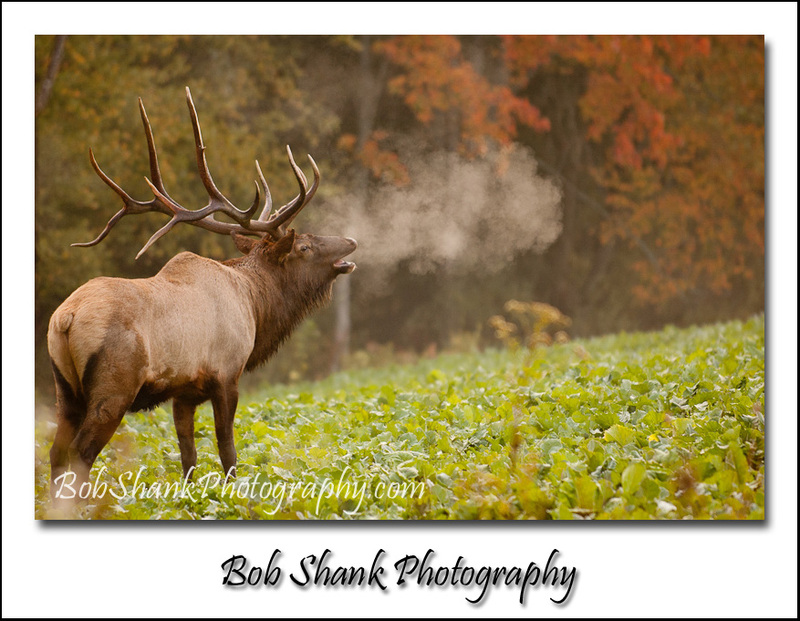 On a recent photo excursion to Elk County, Pennsylvania to photograph the elk, I captured an interesting photo of a cow. The setting sun was behind this cow so a silhouette was in my thinking. 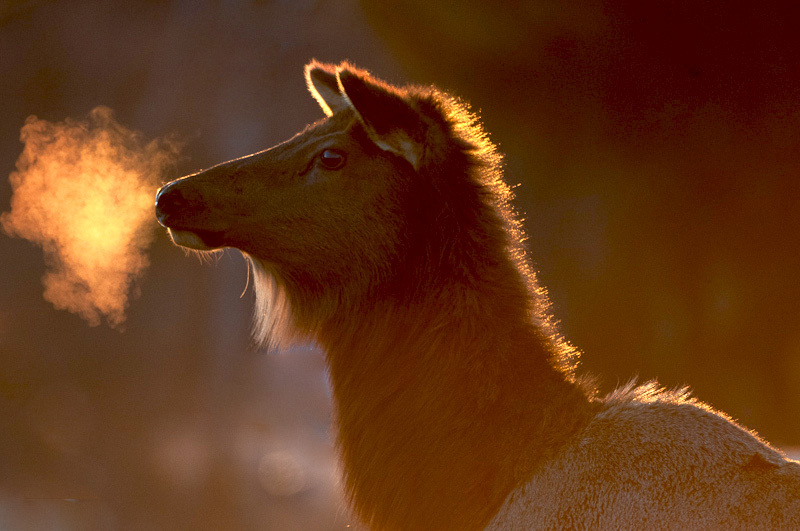 However, the warm sun rays provided enough light to illuminate the visible breath coming out of this elk’s mouth. 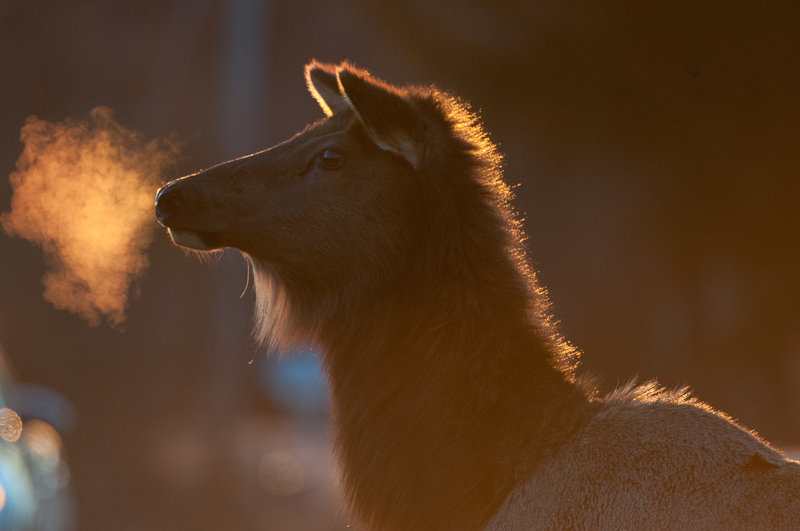 It was a chilly evening and the condensation of this cow’s breath was visible in the light. When I returned home, I knew I wanted to use this photograph if at all possible. But the problems were many-fold. There was some nasty sun glare from the sunlight hitting the lens. I thought maybe I could do a little touch-up in Photoshop and was hoping to be able to salvage this photograph in some usable form. I am not sure I succeeded quite yet. However, I thought I would share both a before photo and an after photo to let you see what I’ve accomplished so far. I still have a ways to go. Do you think this photograph is usable or am I wasting my time? Yesterday, I shared how to create a Photoshop action to create a Matte Frame Effect for your photographs. I am using this method for both my photo blog and, with slightly larger images, on Google+. The process is quick and simple once set up. However, I wanted to see if I could execute the process right from Lightroom instead of having to switch software programs manually. It worked! I will explain this process, taking it one step farther, so if you have Photoshop and Lightoom, you will be able to replicate this for yourself. The goal is to make it easier to make photographs ready to share with others. Here are the steps to using the effect from Lightroom. I am assuming you already created the action I shared in yesterday’s blog post. You should add another step to that action to have it automatically save the newly created framed photo. Do this by clicking on the last step of the action and then recording: File, Save As, Format=JPG, Save, and then click OK for the JPG option. (I allow the “copy” to remain the suggested file name) Now stop recording the Action. Then test the action in Photoshop to make sure it works properly. Step 1 : Create a droplet in Photoshop by clicking on File, Automate, and Create Droplet. Choose the Desktop as the location to save the droplet, this way it will be easy to access for the next step. Choose the Action you created yesterday from the drop-down box. Then click the OK button. This creates a Droplet that now appears on your Desktop. Step 2: Open Lightroom. From the Grid screen, click on Export in the bottom left portion of the screen. I previously created a User Preset, which sizes the image and sets other preferred options for exporting to my blog. You need to create such a preset for yourself. Step 3: From your Desktop, right click on the newly created Droplet and choose Copy. Now go to Lightoom and from the Grid Display click on Export. Click on your newly created preset to use for this procedure, and go to the bottom and click the After Export: Option Box and choose Go to Export Actions Folder Now. Click on the Folder “Export Action” and right click and Paste. This puts the droplet into the Actions Folder in Lightroom so you can later delete the Droplet from your Desktop. Close this folder box once pasting is completed and go to the After Export option and click on the Option Box. You should now see the Droplet listed here. If not, close Lightroom and try again. Start Lightroom and go to the Grid Display and click on a photograph. Now click on Export. Then click on the User Preset you created and valla the process is executed and you just created a Matte Frame of that photograph! I created two different Actions and Presets–one for horizontal photos and one for vertical photos. I also created two different ones for when I want to post in Google+ since I use slightly larger images when posting there. I love this process because it makes posting photos quick and easy. Again, this all sounds much more complicated than it really is in actuality. Follow the steps and get it to work for you. It is a great way to automatically set up images for sharing on a blog, Google+, or wherever. If you have any questions about the process feel free to ask here in the comments. And let me know if you use this or a similar process when sharing your own photographs. 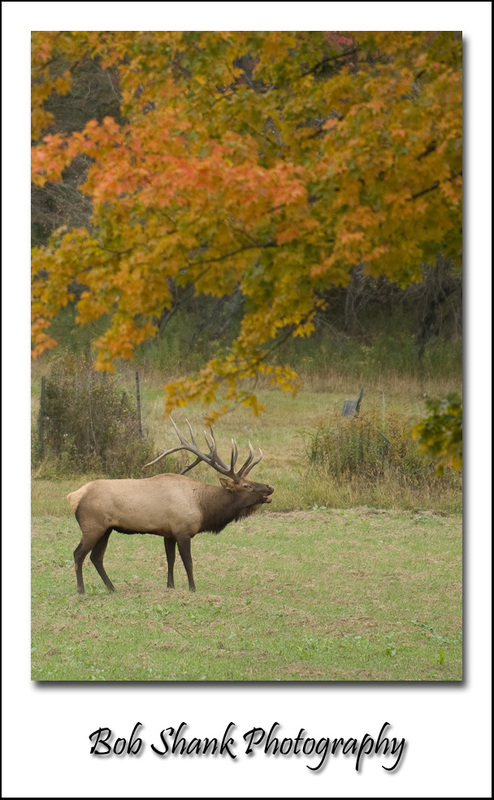 We saw this bull several times during the rut this year. He is magnificent in many ways. Just look at his antlers! As a photographer I would prefer him not having that collar around his neck. It just seems far too distracting to me and I don’t even have to wear it! 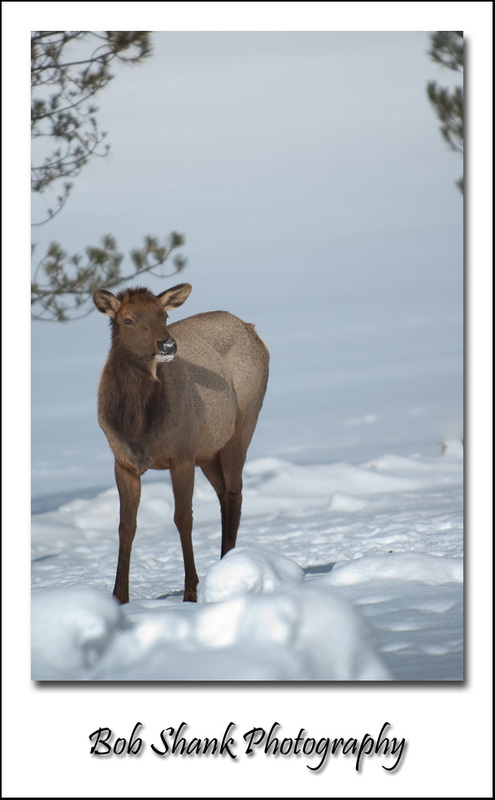 I understand, however, that it helps the Pennsylvania Game Commission track the elk and assist in the herd size estimations. I further realize that I could spend the time in Photoshop to carefully remove the collar from the photograph, but I am far too influenced by my college training in journalism to feel right about doing that. 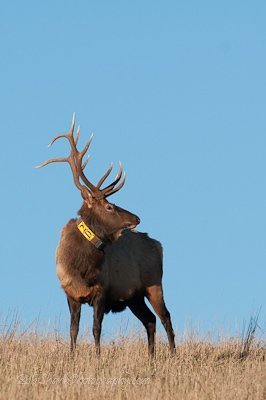 So, I resort to documenting these elk just as they are–collars and all. 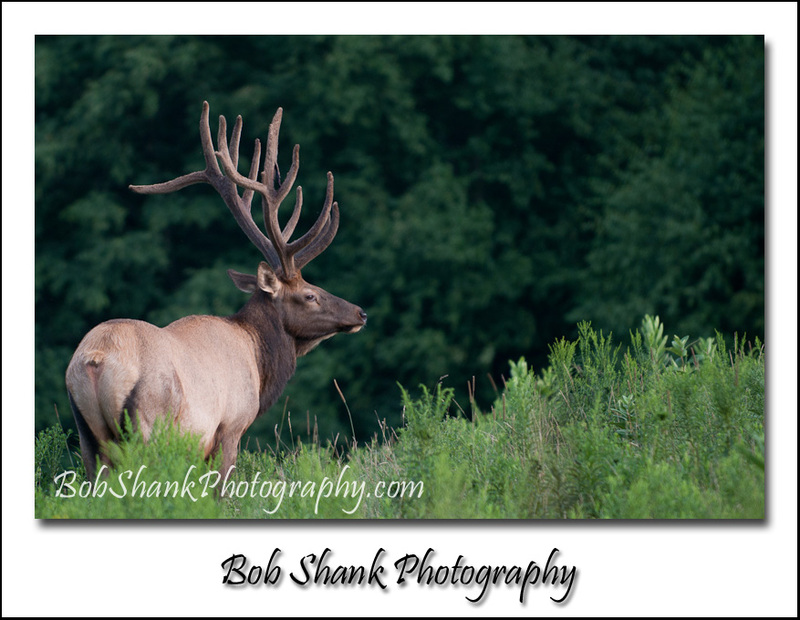 After all, part of our joy of photography also serves as a type of documentation of the elk herd here in Pennsylvania. I like this image for several reasons. The bright blue sky provides an awesome background, as I mentioned yesterday. I also like how the bull appears to stand out and almost pop off the screen. Those antler aren’t bad either. And, to a degree, I even like that I can readily read the number and letter “2D” on this bull’s collar. It clearly shows exactly which bull this is among the herd.